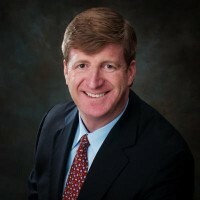 Representative Patrick Kennedy served 16 years in the U.S. House of Representatives, and is predominantly known as author and lead sponsor of the Mental Health Parity and Addiction Equity Act of 2008. This dramatic piece of legislation provides tens of millions of Americans who were previously denied care with access to mental health treatment. Now, Representative Kennedy is the co-founder of One Mind, a national coalition seeking new treatments and cures for neurologic and psychiatric diseases of the brain afflicting one in every three Americans. One Mind for Research is dedicated to dramatic enhancements in funding and collaboration in research across all brain disorders in the next decade. This historic grassroots endeavor unites efforts of scientists, research universities, government agencies, and industry and advocacy organizations not only across the country, but throughout the world. Representative Kennedy is bringing everyone together to design the first blueprint of basic neuroscience, to guide efforts in seeking cures for neurological disorders affecting Americans. Representative Kennedy is the founder of the Kennedy Forum on Community Mental Health which served as a vehicle to celebrate the 50th anniversary of President Kennedy’s signing of the Community Mental Health Act, the landmark bill that laid the foundation of contemporary mental health policy and provided Representative Kennedy with the platform to launch a bold, ongoing effort to advance the work President Kennedy began. The Kennedy Forum continues to advocate for mental health parity. Representative Kennedy has authored and co-sponsored dozens of bills to increase the understanding and treatment of neurological and psychiatric disorders, including the National Neurotechnology Initiative Act, the Genomics and Personalized Medicine Act, the COMBAT PTSD Act, and the Alzheimer’s Treatment and Caregiver Support Act. Representative Kennedy is a winner of the American College of Neuropsychopharmacology Distinguished Service Award, the Society for Neuroscience Public Service Award, the Peter C. Alderman Foundation Humanitarian Award, Centennial Award from the Clifford Beers Foundation, the Autism Society of America Congressional Leadership Award, the Depression and BiPolar Support Paul Wellstone Mental Health Award, the Epilepsy Foundation Public Service Award and has been recognized by many organizations for his mental health advocacy. In 2014, he is being recognized by the Society of Biological Psychiatry, The Samaritan Institute, and The Association for Medical Education and Research in Substance Abuse (AMERSA). He is also founder of the Congressional Down Syndrome Caucus and the 21st Century Healthcare Caucus, as well as an honorary advisor to SAM-Smart Approaches to Marijuana. Representative Kennedy lives in Brigantine, NJ, with his wife, Amy, and their three children. “Patrick Kennedy has always been a tremendous supporter of IAVA and the veterans community. In IAVA’s early days on Capitol Hill, Patrick was one of the first members of Congress to understand the urgent issues facing post-9/11 veterans. During his time on the House Committee on Appropriations Subcommittee on Military Construction-Veterans Affairs, Patrick worked tirelessly for better mental health care for our vets and closely with IAVA on the Lane Evans Veterans Health and Benefits Improvement Act. Now, his innovative work with OneMind is setting the standard for care and support around issues like TBI and PTSD. He follows in the footsteps of his uncle President John F. Kennedy, a decorated World War II vet, and his father Senator Ted Kennedy, in keeping veterans support a top priority for the entire Kennedy family. We are thrilled to have Patrick now leading IAVA’s future as a board member,” said IAVA Founder and CEO Paul Rieckhoff.